There are loads of guys that are "hard working," that never make it in the NFL. The "Vanilla Gorilla" (Lance Long) last year worked his tail off, only to get cut. Why did he get cut, because he didn't have the ability to do his job, same as Nate. The job that Lance was being asked to do was just to make the team as a #4-5 WR. The job Nate was being asked to do (and was paid to do) was to be our #2 WR. Nate does not have the ability to fill that role, and that was painfully obvious his second season here. When you fail to hold people accountable, and fail to reallocate proper funds and proper job descriptions to personnel, it IS in fact disheartening and gives a "phuck it" attitude to everyone involved. Who here hasn't seen someone that didn't deserve a promotion, their job, or their salary go to work every day? And who here hasn't been effected emotionally by it? I would contend nearly everyone on here has. It's human nature, and, surprisingly to some people on here, NFL players are in fact human. Schwartz doesn't help the situation, but if anything he creates "too much fire" to the point of causing drama. It's over-paid under producing players that lack accountability like Nate, Dom, Peterman, Cliff, Pettigrew, and Levy that rip the heart out of this team, and our failure to promote and develop younger, better talent, that causes our lack of fire. Fix that and you've fixed half the problem. The fire WILL come back if you fix that issue, after that THEN you have to worry about Schwartz and his lack of discipline. Nate's situation isn't the same as Long, Nate still has the ability to be a productive WR just not in the way they were hoping. Your the only person that thinks Burelson doesn't add anything to the team and the only one that thinks he held other WRs down. He has been a mentor to the WRs and the best utility WR they have on the roster. There is nothing to hold Nate accountable for unless you want to thank him for being a positive influence on other players. Nate wasn't "promoted" he was brought in as the number 2 and was there before most of the players on the roster. Him being the number 2 receiver hasn't hindered anyone from making more money or proving themselves to be better. If they had someone to replace him on the roster he would have been gone, but the last guy the could of got pissed that CJ was getting more targets then him. I can tell you without question that I have never been discouraged by an overpaid boss or coworker as long as my growth isn't being stunted or my earning potential being slowed. Nate hasn't prevented an extension or a signing and even gave up some money to help. Every problem you have with Nate is a you problem, not an issue the team has with him. Dom, Peterman, Cliff, and Levy I agree they don't add anything productive to the team or their attitude is bad enough to be a negative, but Nate isn't in that category. It doesn't matter that Nate's situation is different than Long's, NATE CAN'T DO THE JOB HE WAS BROUGHT IN TO DO, yet he's still doing it, and was still getting paid as if he were capable. That's the end of the issue, and it wasn't just Nate, it was all of the players that I mentioned. THAT KILLS A TEAM, it kills morale at any organization. Being here "before" other players isn't justification for gifting him his position. That's a load of crap. Regardless of whether he did or didn't "hinder" anyone else's promotion, he was getting paid undeservingly, and he wasn't qualified for his job, period. End of the discussion. That's all you need to break team morale, and prove that upper management is ineffective or flat out doesn't care. It's not a black and white issue, it's real life. There are many shades of gray here because of the things they get from Nate. Nate couldn't be the eraser, so the Lions have brought in different players to be the deep threat while Nate does all the dirty work down low. Nate got paid $2M dollars in 2011 and again in 2012, his big salary came this off season and he cut that in half. The players on the team didn't see his signing bonus(only $3.5M), so they have no reason to feel Nate is over paid. His contract was only $5M/yr and was signed when the cap was still jumping up every year, that wouldn't have even been a lot for a good slot receiver/WR 2 if the flat cap hadn't happened. I hate to point this out, but I don't thing War was trying to even spark a debate about the Lions current Front office, nor their management of Nate Burleson. This veered way off topic. Yeah, it sure has. WJB just always uses Nate as some shinning example of mismanagement by the front office and I find it to be false. Again, I see Nate's contract as part of a bigger problem, addressed with multiple players that you choose to ignore. It is a black and white issue. In total, what we get from Nate isn't worth his salary, period. Nate ONLY got paid $2M dollars those two respective years because he took NON GUARANTEED salary and turned it into GUARANTEED roster bonus later. His contract is for 5 years, $25M dollars - about double what he's worth. That's the end of the story. I don't care if he's reading little kids books, and babysitting Mayhew's grand kids in the mean time, what he brings to this organization is not what he was paid to do, he's not worth what he's getting, and his "intangibles" don't make up for his deficiencies. Where do you get that the players on the team don't/didn't see his signing bonus? First off, I have never brought up Nate's off field activities but you do for some reason. He is a teacher on THE TEAM, his work ethic is a good influence on THE TEAM. His contract is actually 5 yrs/ $23M now. His signing bonus was low enough those restructures actually were a good thing because Nate was willing to take a pay cut this year. With those restructures they managed to keep his cap hit manageable and they could cut him next season for very little or restructure him down to about $2M. This is really the only year his cap hit is significantly higher than it should be. I say none of the players saw/see his signing bonus because they weren't there when he got it. Players don't get on the web and look at everyone's contracts that's their agents job to be concerned with that stuff. I never disregarded that there were other people on this team that fall into what you have been saying. I even agreed that Dom, Peterman, Cliff and Levy are/were problems. I don't disagree with your premise about bad overpaid players causing a bad locker room. Anyone who thinks there's a player in this league that will steal attention from CJ, I want some of what they're smoking. CJ will always demand double and triple teams. When Nate was healthy and Titus wasn't inside his own head and Best was still healthy, they made plays. Losing Best allowed teams to focus on Nate and Titus. Last year Nate had his moments, Titus went mental and injuries again took away the other options. The interior line also didn't make it hard or necessary for a defense to bring safety help to stop the run. IF the interior line plays better with Warford and forces teams to bring an extra defender into the box, the other receivers will benefit. If teams don't bring that defender down, the running game will benefit. It's unfair to judge anyone individually when an entire aspect has been absent from the offense for years. No one would have succeeded in that position, so nitpicking about a contract is pointless. Nate by himself wasn't the problem out there on the field by any stretch of the imagination. what you are saying now is far different than when you said it wasnt unusual for young men lewis' age and that the lions didnt really have a problem compared to other teams - pointing out some other teams with arrests. you were taking the same soft stance as the Lions do, the one that contributes to this occurring over and over. i dont think i said that i was in favor of cutting lewis at the drop of the hat, i was just mad at him for being a bum, and more mad at the organization for continually taking this soft stance on these issues. No it's not different. I never said the Lions are doing a good or even adequate job with how they were handling these players. My point of listing out the other teams was that even the best teams couldn't stop a guy from doing something stupid one time, so I feel you should give a player a chance to reform. Every time a player on the Lions had a second incident should be looked on as a failure of the Coaches and Mayhew for not setting up some type of support system and some type of real consequences for a second offense. You may have not said specifically you were in agreement he should be cut immediately like WJB did and I apologize if I lumped you in with him unjustly. OK, so I think it's time to put this thread back on track and speak about what we would do if we were the GM of the Lions. As of now, the Lions have an open head coaching spot, as well as an opening at offensive coordinator. The Lions have several free agents to make decisions on, and have some players who need to be reworked or extended to resolve impending cap issues. So, here's what I would do as GM. Head Coach - I would have Whisenhunt at the top of my list, for sure. However, not at any cost. As a GM, I would still want final say so on personnel matters. Lovie Smith got a deal in TB that allows him final say on personnel, and as a GM I wouldn't allow that. Would the HC and coaching staff have strong input? Yes, absolutely. But too often coaches want to go in a different direction than what the scouting department would go. Scouts are paid to scout, year round. Coaches don't have that luxury, and sometimes their ego goes into overdrive and they think their eyes are better than those of scouts or others. As a GM, the job is to take an unbiased approach and keep that facet of the coaching staff under control. Would the coach be allowed to hire and fire his own staff? Yes. But I would dictate that any coordinators and position coaches must fit the systems in place. No hiring a DC to run a 34 system, or an OC that wants to install a power running game where one doesn't exist. I would also insist on getting a dedicated QB coach for Stafford who can push him rather than baby him. He needs a slap. Brandon Pettigrew - It will depend on what he asks for. If he asked for any contract paying him more than $2.5 per season on average (salary plus bonus money), I'd let him walk. The tight end position is evolving quickly in the NFL, and blocking TEs can be had in the late rounds. With Michael Williams and Joseph Fauria on the roster, we have a combination of players who has Pettigrew's skill set. All we would need is a speedy, deep threat TE to make the combination complete. Don Carey - Lions should resign him to a two or three year deal. Minimum salary, with a modest signing bonus. He's worth it as a reliable backup and ST player. Dorin Dickerson - it would depend on what happens with Pettigrew, and whether or not the Lions draft a TE or sign on in FA. If Pett leaves and no other TE is signed or drafted, I'd sign him to a deal that is minimum salary with a bonus for making the 53 man opening roster. Andre Fluellen - let him test the waters (again). But he is a decent depth player. (Another officlal third round bust). Jason Fox - Lions should let him go. LaAdrian Waddle is a more reliable starter, and doesn't get injured like Fox. Depth players should be reliable and be able to stay healthy for more than one series. Fox isn't NFL material. Dylan Gandy - I'd rather see the Lions draft an interior player in the late rounds than re-sign Gandy, who has shown me nothing of worth in all his time here. Rodney Austin can take over his role. Shaun Hill - Having a reliable back up QB is important. If the Lions truly feel that they have the players to contend for the NFCN title, it would be a shame that they don't make it because of a possible injury to Stafford and having nothing but a scrub as a backup. I'd rather see the Lions re-sign Hill and only carry two QBs on the roster, than to lose him in FA. It would all depend on his asking price. I think a two year deal, worth $6.5M would be fair. They then need to cut ties with Kellen Moore, and there is no need for a third QB unless they honestly feel that guy can eventually develop into a solid starter or backup. Moore is neither. Israel Idonije - Showed nothing when healthy. Say bye-bye. Rashean Mathis - Depends on what the Lions do with the draft, free agency and if they are prepared to eat some money and part ways with Chris Houston, who just signed a new 5 year deal last March. Nothing more than a one year deal. Rocky McIntosh - I would make an effort to sign him. I think he's a better backup than some of our other young LBers, who have shown nothing (Whitehead and Lewis). Dom Raiola - One year deal, moderate salary. Even if the Lions draft a center, they need to retain Dom to push the guy in camp and teach. At 35, he's not quite over the hill and he did have a really good season. Jeremy Ross - I believe he's a FA. Sign him to a one year deal for the return position and WR depth. Micheal Spurlock - Get lost! Jon Wendling - He's good, but not great, on Special Teams. He's not an adequate replacement as a defensive starter. If Don Carey is re-signed, there may be no reason to ink Wendling to a deal. But, it would depend on what the Lions decide to do with Louis Delmas as well. Willie Young - He needs to be re-signed, but not at a top tier salary. After a down year in 2012, he did pretty good in 2013 when pushed into a starting role for much of the year. I think a three year deal, worth about $4M per season would be fair on average would be fair. Keep the signing bonus low (about $1.5M) so that the bulk of the money to be earned would be in salary. This way if the Lions want to part ways next season or after, it won't cost them much in dead money. Joique Bell - Tender him at a high level, or sign him to a multi-year deal to limit his hit on the 2014 cap. He's earned it, and in my opinion was better than Reggie Bush. Kris Durham - It is my belief the Lions would be foolish to let him walk without tendering him. Maybe not give him a high level offer, but I'd at least make an effort to keep him. While many were hyper-critical of his level of play, I would like to remind those that he was never expected to be a starter or contribute that much. He played better than most give him credit for. Nate Burleson - due $5.5M in 2014, he has said he's willing to take a paycut to stay. I'd offer him this deal: turn his money due in 2014 into a two year deal, paying him a signing bonus of $1M, with a salary of $1.75M in 2014, and salary of $2.25M in 2015 with workout bonus' of $250k in both '14 and '15. Louis Delmas - also due $5.5M in salary, with a $500k bonus. Despite being able to play the entire season, his effectiveness was reduced significantly. His range was never impressive, but his knee issues were noticeably affecting his ability to cover the field as well as he used to. Limited practice time also was noticeable. If the Lions draft a free safety, or can find one in FA, it's time to say good bye to Delmas. Otherwise, rework his deal to extend him an extra year like Burleson's deal. 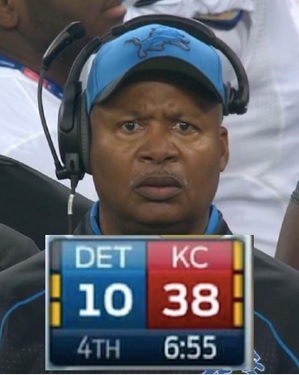 The Lions can't give this guy that much money in 2014. Ndamukong Suh - He is due $11.15M in 2014 as part of his backloaded rookie deal. The Lions can't support paying him that much for the season, so they need to rework the deal. I'd give him a six year rework, extending him to 2020, paying him around $70M overall. Give him a signing bonus of around $20M, with a 2014 salary of $1.5M. His cap number then becomes $4.833 for 2014. Stephen Tulloch - He is due a salary of $3.75M in 2014. I'd offer to change $2.25M of that into a signing bonus to be spread out over the last three years of his deal, lowering his cap hit in 2014 to $2.25M, saving $1.5M. DeJon Gomes, Mikel LeShoure, Kellen Moore (see Shaun Hill), Kevin Ogletree, Montell Owens. None of these guys did anything of worth in 2013, and I don't see them contributing in 2014. Let 'em go. I would definitely be looking for corners of value, as well as some WR depth. Also, I'd keep my options open for a tight end, kicker and possibly a free safety to replace Delmas. I'd definitely be looking for a trade down partner. If the Lions are targeting a WR, I'd take Sammy Watkins at 10 if he's available, otherwise I'd move down no more than six or seven spots, and hope that either Darqueze Dennard or Ha'Shean Clinton-Dix are available at that spot. Other options would include an outside linebacker who can rush the passer, or maybe even a playmaking TE like Ebron or Amaro. Much would depend on who the new HC is, and what the offensive make up would need to be, as well as what happens with the free agency moves. I don't have anything to add really, as I agree with most of this. I just wanted to say that this is impressive. I don't know how long you spent on this, but nice job.